For the latest edition of this study (released April 2, 2014), please click here. Since 2000, state and local burdens have increased from 9.3 percent to 9.9 percent. During the 2010 fiscal year, however, burdens remained fairly stable, only decreasing slightly from their 2009 levels. In 2010, the residents of New York, New Jersey, and Connecticut paid the highest state-local tax burdens in the nation. These are the only three states where resident taxpayers forego over 12 percent of income in state and local taxes. Residents of Alaska, who have consistently been the least taxed state for nearly three decades, again paid the lowest percentage of income in 2010 at just 7.0 percent. The next lowest-taxed states were South Dakota, Tennessee, and Louisiana. State-local tax burdens are very close to one another and slight changes in taxes or income can translate to seemingly dramatic shifts in rank. For example, the 20 mid-ranked states, ranging from Oregon (16th) to North Dakota (35th) only differ in burden by just over one percent. While some studies aim to tally the total revenues collected from state and local governments, this study moves the focus from the tax collector to the taxpayer by focusing on tax burdens. Elizabeth Malm is an Economist at the Tax Foundation and Gerald Prante is a Tax Foundation Adjunct Scholar. 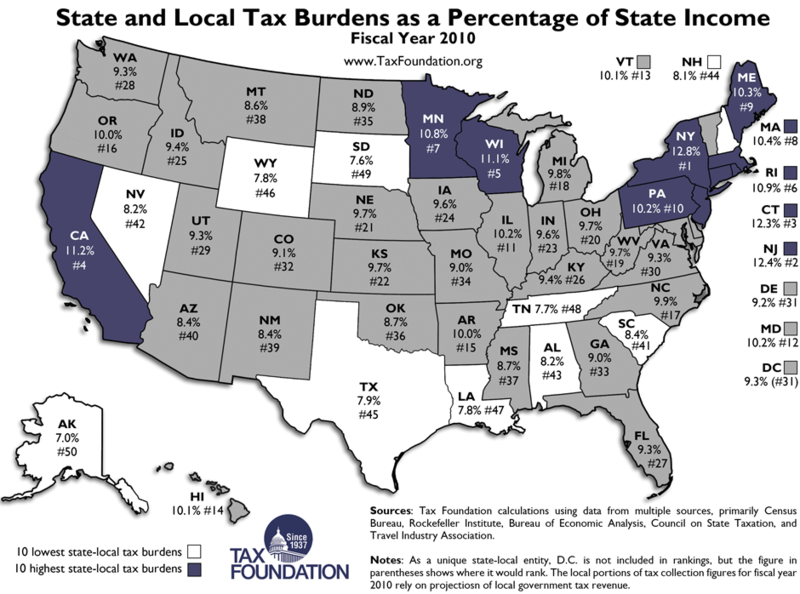 For nearly two decades the Tax Foundation has published an estimate of the combined state and local tax burden shouldered by the residents of each of the fifty states. For each state, we compute this measure of tax burden by totaling the amount of state and local taxes paid by state residents to both their own and other governments and then divide these totals by each state’s total income. We not only make this calculation for the most recent year, but also for earlier years due to the fact that income and tax revenue data are periodically revised by government agencies. Our goal here is to move the focus from the tax collector to the taxpayer. We aim to find what percentage of state income residents are paying in state and local taxes and whether those taxes are paid to their own state or to others. We are not attempting to find the amount of money state and local governments have collected; the Census Bureau publishes the definitive comparative data answering that question. When Connecticut residents work in New York City and pay income tax to both the state and the city, the Census Bureau will tally those amounts as New York tax collections, but we will count them as part of the tax burden of Connecticut’s residents. When Illinois and Massachusetts residents own second homes in nearby Wisconsin or Maine, local governments in Wisconsin and Maine will tally those property tax collections, but we will shift those payments back to the states of the taxpayers. When people all over the country vacation in Disney World or Las Vegas, tax collectors will tally the receipts from lodging, rental car, restaurant, and general sales taxes in Florida and Nevada, but we will count those payments in the states where the vacationers live. Every state’s economic activity is different, as is every state’s tax code. As a result, each varies in their ability to “export their tax burden”—that is, to collect revenue from nonresidents. Economists have been studying this phenomenon since at least the 1960s when Charles McLure (1967) estimated that states were extracting between 15 and 35 percent of their tax revenue from nonresidents. Much of this interstate tax collecting occurs through no special effort by state and local legislators or tax collectors. Tourists spend as they travel and all those transactions are taxed. People who own property out of state pay property tax out of state. And the burden of business taxes is borne by the employees, shareholders, and customers of those businesses wherever they may live. Many states, however, make a conscious effort to levy taxes specifically on nonresidents, and that effort seems to be accelerating. In fact, many campaigns for tax-raising legislation in the last several years have explicitly advertised the ability to push the burden of a certain tax onto non-voting, nonresident payers as a reason for resident voters to accept the tax. This beggar-thy-neighbor effort has been mostly legislative, exemplified by a wave of tax hikes on tourism: hotel rooms, rental cars, restaurant meals, and local sales taxes in resort areas. States and localities have also targeted nonresidents with higher property taxes and, in rare cases, higher income taxes. The effort to utilize nonresidents has also been administrative, as departments of revenue have pursued nonresident income tax revenues from individuals and corporations with far more zeal than in years past. In some cases, the tax exporting is a wash from the tax collector’s perspective. That is, a state collects the same amount from nonresidents as its own residents pay to out-of-state governments. But in many cases there is a significant difference—some states are able to collect a significant portion of revenues from out-of-state taxpayers. By tallying tax payments in the taxpayers’ home states, this report allows policymakers, researchers, the media, and citizens to go beyond a mere measure of collections to the question of which states’ residents are most burdened by all state and local taxes. The state-local tax burdens of each of the fifty states’ residents are quite close to one another. This is logical considering state and local governments fund similar activities such as public education, transportation, prison systems, and health programs, often under the same federal mandates. Furthermore, tax competition between states can often make dramatic differences in the level of taxation between similar, nearby states unsustainable in the long run. Therefore, it is not surprising that slight changes in taxes or income can translate to seemingly dramatic shifts in rank. For example, the twenty mid-ranked states, ranging from Oregon (16th) to North Dakota (35th), only differ in burden by just over one percentage point. However, while burdens are tightly clustered in the center of the distribution, states at the top or bottom can have substantially higher or lower burdens. Notes: As a unique state-local entity, D.C. is not included in rankings, but the figure in parentheses shows where it would rank. The local portions of tax collection figures for fiscal year 2010 rely on projections of local government tax revenue. Sources: Tax Foundation calculations using data from multiple sources, primarily Census Bureau, Rockefeller Institute, Bureau of Economic Analysis, Council on State Taxation, and Travel Industry Association. In fiscal year 2010, the residents of three states stand above the rest, paying the highest state-local tax burdens in the country: New York, New Jersey, and Connecticut. These are the only states where taxpayers forego over 12 percent of their income in state-local taxes, over a full percentage point above the next highest state, California. New York, New Jersey, and Connecticut have occupied the top three spots on the list since 2005. This may be partially attributed to high levels of state expenditure which must be sustained by high levels of revenue. Further, in the case of Connecticut and New Jersey, relatively high tax payments to out-of-state governments add to already high in-state payments. This is likely related to the fact that these are high income states that pay high levels of capital gains. High levels of capital gains will result in residents paying an increased share of other states’ business taxes. New York residents paid the most at 12.8 percent of income. Next on the list are New Jersey and Connecticut, where residents paid 12.4 and 12.3 percent respectively. Rounding out the top ten in highest state-local burdens are California, Wisconsin, Rhode Island, Minnesota, Massachusetts, Maine, and Pennsylvania. Alaska consistently has the lowest tax burden in the nation, where state residents paid just 7.0 percent in 2010. The next lowest state, South Dakota, saw residents paying over half a percentage point higher at 7.6 percent of state income. The rest of the bottom ten states are Tennessee, Louisiana, Wyoming, Texas, New Hampshire, Alabama, Nevada, and South Carolina, with residents of these states paying between 7.7 and 8.4 percent of income. See Table 1 and Figure 1 for percentages and rankings for all fifty states. The last decade saw a steady growth in average tax burdens, from 9.3 percent in 2000 to 9.9 percent in 2009. Average tax burdens fell a very small amount in 2010 (0.006 percentage points). A majority of state residents’ tax burdens decreased. The most pronounced drops in burdens between 2009 and 2010 occurred in Delaware (decrease of 0.7 percentage points), North Dakota (decrease of 0.5 percentage points), and Louisiana (decrease of 0.5 percentage points). Delaware’s relatively large decrease moved it significantly down the rankings list, from the 17th highest to the 31st highest burden. North Dakotans also saw a drop in tax burden, from 30th to 35th. Residents of some states, however, saw increases in their state-local burden. The largest increases were in Alaska, Colorado, and Hawaii. Resident tax burdens in these states rose by 0.5, 0.4, and 0.3 percent, respectively. For Alaska, this did not result in any change in ranking. Colorado’s ranking worsened, rising from 39th to 32nd. Hawaii’s rank worsened from 18th to 14th. Some states are able to shift significant portions of their tax burdens to nonresidents. Alaska provides the best example. It is able to export over 75 percent of its tax collections to residents of other states. According to the Census Bureau, Alaska’s state and local tax collections are among the nation’s highest. If those tax collections are compared directly to Alaskans’ income, the burden appears much higher than in many other states. We argue that this is not an accurate measure of the true tax burden faced by Alaskan taxpayers. Alaskans pay no state-level tax on income and face no state-level sales tax (though there is a local option sales tax with rates that can range from 1 to 7 percent). But Alaska does have a special, prodigious source of revenue: severance taxes on oil extraction. In fact, Alaska is able to raise over 70 percent of its revenue from taxes on oil extraction, and the state’s residents actually receive checks at tax time from a reserve fund of billions in oil tax revenue. The burden of Alaska’s oil taxes does not fall predominantly on Alaska residents. This study assumes that much of the economic burden of these taxes falls not on Alaskans but rather on consumers of oil and oil-based products across the country in the form of higher prices. Therefore, to correctly portray how low the Alaskan residents’ tax burden is, we allocate Alaska’s oil severance tax to other U.S. states based on oil and gas consumption. Once this allocation is made, Alaskans’ tax burden falls from among the nation’s highest to the lowest. Taxes levied on mineral extraction in other states have similar but less dramatic effects. Resource-rich states, such as Alaska and Wyoming, are only the most dramatic examples of tax exporting. Major tourist destinations like Nevada and Florida are able to lower the residents’ burden by taxing tourists, who are often nonresidents. Nationwide, over a quarter of all state and local taxes are collected from nonresidents. As a result, the residents of all states pay surprisingly high shares of their total tax burdens out of state. Table 2 includes the per capita dollar amounts of income and tax that are divided to compute each state’s burden as well as the breakdown of in-state and out-of-state payments. An interesting observation is that there is no tax on wage income in six of the eight lowest-taxed states. Similarly, Nevada (42nd), South Dakota (49th), and Wyoming (46th) do without a corporate income tax. Further, Alaska (50th) has no state-level sales taxes, though it does allow local governments to levy a sales tax. While this is an interesting correlation, it does not answer the question of whether levying fewer types of taxes leads to lower tax burdens, or whether a political demand for lower taxes leads to fewer types of taxes being levied. Also worth considering is the possibility that opting to not levy a personal income tax causes a state to rely more on other forms of taxation that might be more exportable. Not every state with a significant amount of nonresident income uses it to lighten the tax load of its own residents. Maine and Vermont have the largest shares of vacation homes in the country, and they collect a large fraction of their property tax revenue on those properties, mostly from residents of Connecticut, Massachusetts, and other New England states. Despite this, Maine and Vermont still rank ninth and thirteenth highest in this study. Sales tax in the District of Columbia is another example—a significant portion is paid by residents of Virginia and Maryland who work within Washington, D.C. and pay the city’s sales and meals taxes. Another important factor that affects a state’s ability to impose its tax burden onto nonresidents is the question of who ultimately bears the economic burden of taxes on businesses. Businesses bear the legal burden of business taxes, but the ultimate economic burden of the tax is passed onto consumers in the form of higher prices, to employees in the form of lower wages, and to shareholders in the form of smaller returns. In this study, we assume that the majority of business taxes are borne by consumers, though some are borne by shareholders and workers. In many cases, a substantial fraction of those who bear the burden are nonresidents. Finally, some states have large numbers of residents employed out of state who pay individual income taxes to the states where they work. When a metropolitan area attracts workers from nearby states, a large portion of wage income in a state can be earned by border-crossing commuters. On the other hand, some states have reciprocity agreements in which they tax their own residents regardless of where they work. In cases of lopsided commuting, however, states rarely pass up the chance to collect from nonresidents. In addition to allocating severance taxes to other states, this study also allocates taxes on corporate income, commercial and residential property, tourism, and nonresident personal income away from the state of collection to the state of the taxpayers’ residences. Despite the importance of nonresident collections and the increasing efforts to boost them, the driving force behind a state’s long-term rise or fall in the tax burden rankings is usually internal and most often a result of deliberate policy choices regarding tax and spending levels. Nationally, average state-local tax burdens have fallen from 10.3 percent to 9.9 percent since 1977. Burdens, on average, have risen from 2000 to 2009, followed by a very slight decrease in 2010. Some states’ taxpayers are paying the same share of their income now as they were three decades ago, but some have paid steadily more and others less. The tax burden in every state changes as years pass for a variety of reasons, including changes in tax law, state economies, and population. Further, changes both within and outside of the state can impact tax burdens. See Tables 3 and 4 for historical trends in burdens and rankings. Note: The local portions of tax collection figures for fiscal year 2010 rely on projections of local government tax revenue. Once again, Alaska is the extreme example. Before the Trans-Alaska Pipeline system was finished in 1977, taxpayers in Alaska paid 11 percent of their income in state and local taxes. By 1980, with oil tax revenue pouring in, Alaska repealed its personal income tax and started sending out checks to residents instead. The tax burden plummeted, and now Alaskans are the least taxed, with a burden of only 7.0 percent. Other states that have seen significant decreases in burdens are described below. North Dakotans’ burden has fallen from 11.5 percent to 8.9 percent. Its burden was even lower in 2005, at 8.3 percent, but it has risen in the last few years and now ranks 35th. The District of Columbia has experienced a burden decrease of 2.3 percentage points since 1977, when its ranking was 7th. In 2010, its burden has dropped to 9.3 percent from its 1977 level of 11.5 percent. Arizona taxpayers have seen a decrease of 1.9 percentage points from 1977 to 2010, moving the state from 18th to 40th in ranking over this period of time. Connecticut taxpayers’ burden has risen 2.3 percentage points, from 11.0 percent in 1977 (13th highest at that time) to 12.3 percent in 2010, putting the state in third place. Indiana taxpayers have seen their burden rise from 8.5 percent to 9.6 percent since 1977, and their state now ranks 23th. Ohio taxpayers’ burden has risen from 8.8 in 1977 to 9.7 in 2010, which has increased its ranking from 40th to 20th. Total tax revenues have remained fairly stable from 2009 to 2010, recovering from a sharp decrease in the previous year due to the peak of the nationwide economic recession. As a result of the shrinking economy, state and local tax collections took a significant hit in 2009. Corporate income tax collections are often the most volatile revenue source, and 2010 was no exception: corporate income tax revenues fell by 6.8 percent between 2009 and 2010. Revenue from almost all sources fell in 2010 with the exception of property tax revenue, which grew by 4.2 percent. Individual income tax revenue and sales tax revenue also decreased, falling by 3.8 and 0.5 percent, respectively. The only other time since 1977 that total tax collections have fallen is 2002. Following that contraction in revenue, state and local officials enjoyed annual revenue growth between 7 percent and 9 percent for four years until 2008 when revenue growth slowed significantly to 3.6 percent. The 2009 revenue crash was a shock to those state and local officials who had come to expect 8 percent annual growth in revenues. See Table 5 for recent trends in revenue growth. Sources: U.S. Census Bureau, Tax Foundation calculations. When measuring the burden imposed on a given state’s residents by all state and local taxes, one cannot merely look to collections figures for the governments located within state borders. There is a significant amount of tax shifting across states, and this shifting is not uniform. Further, this shifting should not be ignored when attempting to understand the burden faced by taxpayers within a state. This study is not an endorsement of policies that attempt to export tax burdens. From the perspectives of the economy and political efficiency, states can create myriad problems when they purposefully shift tax burdens to residents of other jurisdictions. This study attempts to quantify the amount of shifting that occurs and understand how it affects the distribution of state and local tax burdens across states. The state and local tax burden estimates for the 2010 fiscal year presented in this paper use the most recent data available as of September 2012 from the Census Bureau and August 2012 from the Bureau of Economic Analysis. For all major tax and income categories, data was available on a state-by-state basis through the end of fiscal year 2010. Each year, state and local governments and federal agencies publish more complete data on public finances, and each year, the Tax Foundation improves its estimates of the state-local burden in each state by quantifying more precisely the portion of the tax burden that goes into the coffers of other state and local governments. For this reason, the entire historical series of state-local burden estimates is revised each year. Our geographic determination of who bears the tax burden is similar to the work done by such organizations as the Congressional Budget Office and the Urban-Brookings Tax Policy Center, which measures tax burdens by income group. In both cases, researchers start with official data on who wrote checks for how much but then attempt to account for how those legal payers shift the burden to others—possibly to others in other income groups or geographic areas. Why shouldn’t tax collections reported by state and local governments and published by the Census Bureau’s Government Finances Division be compared to income to determine the tax burden? We argue that it is important to note that a taxpayer’s true tax burden must include the substantial taxes they pay directly or indirectly to out-of-state governments. Notes: As a unique state-local entity, D.C. is not included in rankings, but the figure in parentheses shows where it would rank. The local portions of tax collection figures for fiscal year 2010 rely on projections of local government tax revenue. The figures presented here as the "FTA Method" are calculations by the Tax Foundation using 2010 data or projections thereof, replicating the methodology that the Federation of Tax Administrators uses each year to calculate each state's tax burden. The tax burden estimates include those items defined as a state and local tax by the Bureau of Economic Analysis, which is essentially equivalent to the Census Bureau’s definition of a tax (codes T01, T09, etc.) plus special assessments. Note that this includes licenses such as occupational and business licenses and motor vehicle licenses. The time frame for the estimates is the standard state fiscal year of July 1 through June 30. Data from the few states that use a different fiscal calendar have been adjusted to the standard fiscal year. No measure of the tax burden is perfect. Our tax exporting estimates do not account for the federal deductibility of state and local taxes paid within the federal individual and corporate tax codes. Essentially, payers of high state and local taxes get a large deduction on their federal tax returns, and that money is then made up with payments from people who have a small state-local tax deduction. This disproportionately favors high-income individuals because of the progressivity of the federal individual income tax. Another component of an ideal tax burden study would be compliance costs and economic efficiency losses. Neither is included here. Further, the tax burden estimates presented here do not weigh the value of the government services provided with tax revenue. This is the norm in such studies. No organization that regularly estimates tax burdens at either the federal or state-local level attempts to account for the compliance and economic costs (i.e. deadweight loss or excess burden) of taxation or the value of government services provided that are financed by those tax dollars. The definition of income used in this study is a hybrid between the Bureau of Economic Analysis’s calculation of “personal income” and the income concept used by the Congressional Budget Office in its annual “Effective Federal Tax Rates” study. The income measure used here adds to personal income the following: capital gains realizations, pension and life insurance distributions, corporate income taxes paid, and taxes on production and imports less subsidies. It subtracts from personal income the nonfungible portion of Medicare and Medicaid, as well as the estimated Medicare benefits that are provided via supplementary contributions (the same for veterans’ life insurance). This measure also subtracts the initial contributions to pension income and life insurance from employers, as well as the annual investment income of life insurance carriers and pensions (much of which is imputed by BEA) that is included in personal income. Note that some small fraction of income is still double-counted over a lifetime, most notably the contributions of individual employees to pension and life insurance funds. There is also a timing problem with respect to the corporate income taxes paid and the fact that capital gains realizations are used as opposed to retained earnings (accrued capital gains). In this study, due to systematic movements across geographies over life cycles (e.g., Arizona, Florida, etc.) and the fact that we are only looking at state and local taxes where the corporate income tax is relatively minor, we use capital gains realizations. For more methodological discussion, see Tax Foundation Working Paper No. 4, at www.taxfoundation.org/files/wp4.pdf. Unless otherwise noted, all years refer to the time period corresponding to the standard state fiscal year (July 1 through June 30), even in those states that follow a nonstandard fiscal year. The average local sales tax rate in Alaska is 1.79 percent. See Scott Drenkard, State and Local Sales Taxes at Midyear 2012, Tax Foundation Fiscal Fact No. 323 (July 31, 2012), https://taxfoundation.org/article/state-and-local-sales-taxes-midyear-2012. The District of Columbia is prohibited by Congress from taxing the wages of nonresident commuters. Gerald Prante, Tax Foundation State and Local Tax Burden Estimates for 2008: An In-Depth Analysis and Methodological Overview, Tax Foundation Working Paper No. 4 (Aug. 2008), http://www.taxfoundation.org/files/wp4.pdf.